Operating a data center increasingly involves complex tasks, such as managing multiple silos of servers, storage, networks, and mission-critical applications. Consequently, IT departments often spend most of their budget maintaining this infrastructure, instead of investing in new projects. 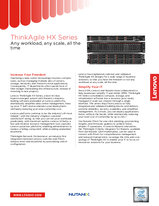 Lenovo ThinkAgile HX Series, a best-in-class hyperconverged system with Nutanix’s industry-leading software preloaded on Lenovo platforms, dramatically simplifies data center management, frees up your IT staff, and accelerates your deployment, ultimately reducing your total ownership cost. Lenovo platforms continue to be the industry’s #1 most reliable†, with the industry’s highest customer satisfaction‡ rating, so that you can run your workloads predictably, with maximum uptime. Lenovo XClarity, a fast and intuitive resource management tool, captures Lenovo proactive platforms, enabling administrators to replace a failing component while avoiding unplanned downtime. ThinkAgile Network Orchestrator, an industry-first integration between Lenovo switches and Prism, reduces error and downtime by automating switch configuration. Lenovo has engineered, tailored, and validated ThinkAgile HX designs for a wide range of business solutions, so that you have the freedom to run any workload, at any scale, all the time. Use Nutanix Prism for one-click planning, provisioning, insights, and firmware updates to achieve faster, simpler IT operations. A Lenovo-Nutanix innovation, the ThinkAgile XClarity Integrator for Nutanix, available from the Nutanix Calm marketplace, can be used in concert with Prism for comprehensive management and reduced manual entry. Leverage the time and cost-savings of ThinkAgile HX to enable your IT to focus on innovative solutions for your business. Lenovo ThinkAgile Advantage provides end-to-end life cycle management for a seamless, simple customer experience for planning, deployment, and maintenance, including a 24/7 Single Point of Support. ThinkAgile HX Series also includes the option of shipping from Lenovo’s factory in a rack, along with any combination of ThinkSystem servers, storage, and networking, which facilitates quick deployment of solutions based on validated HX reference architectures. Now enhanced with even faster processors and memory, Lenovo platforms hold the highest number of performance world records so you can run your workloads at blazing-fast speed for accelerated outcomes. ThinkAgile HX Series models are optimized for a broad set of virtualized workloads for on premises or in the cloud, including ROBO, office applications, analytics, and in-memory databases. Deploy your HCI clusters rapidly and confidently with Lenovo. The 1U 1-node ThinkAgile HX 1000 Series appliance is engineered for light-to-medium workloads (business applications and VDI), optimized for remote office/branch office (ROBO) environments. ThinkAgile HX 2000 Series appliances are available in 1U 1-node form factors, optimized for small and medium businesses (SMBs). ThinkAgile HX 3000 Series appliances are available in 1U 1-node, 2U 1-node, and 2U 4-node form factors. All HX 3000 Series models are engineered for compute-heavy workloads (business applications and VDI) and offer rack-dense, all-flash (-F) and GPU (-G) models. Drive Bays 10x-12x 2.5" 8x-16x 2.5" 6x 2.5"
The 2U 1-node ThinkAgile HX 5000 Series appliances are engineered for storage-heavy workloads (Big Data and enterprise applications) and offer a high-capacity model. The 2U and 4U 1-node ThinkAgile HX 7000 Series appliances are engineered for high-performance and mission-critical workloads (enterprise applications and in-memory databases, including SAP HANA) and optimized for I/O intensive operation. Drive Bays 12x-14x 3.5" 24x 2.5" Up to 24x 2.5"
12x-20x 1TB, 2TB, 2.4TB Up to 20x 1TB, 2TB, or 2.4TB 2.5"
Lenovo ThinkAgile HX Series appliances, powered by Intel® Xeon® processors, enable you to simplify your IT infrastructure and drive down costs through the combination of preloaded easy-to-use software on powerful, extremely reliable hardware. All ThinkAgile HX Series models are backed by world-class Lenovo services and support. ThinkAgile Advantage, in available countries, provides a first-class support experience to make the most of your ThinkAgile products and solutions. You’ll skip the wait and connect directly with skilled technicians through your own dedicated phone line for real-time triaging and troubleshooting. As a single point of contact, your dedicated Lenovo specialist will own your support case end-to-end, ensuring a faster and more seamless resolution. You’ll also enjoy faster time to productivity and reduced system disruption, thanks to the plan’s hardware and software deployment benefit from the Lenovo Professional Services team. To learn more about Lenovo ThinkAgile HX Series Appliances, contact your Lenovo representative or Business Partner or visit lenovo.com/thinkagile. For information about the previously announced (Intel Xeon E5 v4 processor-based) models, visit the HX Series web page. Lenovo (HKSE: 992) (ADR: LNVGY) is a US$45 billion Fortune 500 company and a global technology leader in driving Intelligent Transformation. Lenovo’s data center solutions (ThinkSystem, ThinkAgile) are creating the capacity and computing power that are changing business and society. † ITIC 2018 Global Reliability Report. ǂ TBR x86-based Servers Report 2018. * Visit bit.ly/2AqcBbn for more information. ** Microsoft Hyper-V 2016 support available in the first half of 2019. © 2019 Lenovo. All rights reserved. Availability: Offers, prices, specifications and availability may change without notice. Lenovo is not responsible for photographic or typographic errors. Warranty: For a copy of applicable warranties, write to: Lenovo Warranty Information, 1009 Think Place, Morrisville, NC, 27560. Lenovo makes no representation or warranty regarding third-party products or services. Trademarks: Lenovo, the Lenovo logo, Lenovo XClarity, ThinkAgile, ThinkSystem, and TruDDR4 are trademarks or registered trademarks of Lenovo. Intel® and Xeon® are trademarks or registered trademarks of Intel Corporation or its subsidiaries in the United States and other countries. Hyper-V® and Microsoft® are trademarks of Microsoft Corporation in the United States, other countries, or both. Other company, product, or service names may be trademarks or service marks of others. Document number DS0019, published January 23, 2018. For the latest version, go to lenovopress.com/ds0019.